ou may associate the Emeryville shoreline with shops, or the Scandinavian furniture store Ikea. But what you may not know is that before this place was a commercial mecca, there was a different man-made structure that towered above Bay Area residents: a shellmound. Driving down Shellmound Street may tip you off, too. It did for Bay Curious listener Paul Gilbert, who used to live and work in Emeryville. He would cross Shellmound Street every day for years. “And somewhere along the way I'd heard the story that there used to be a Native American mound of shells somewhere along the shore,” Gilbert said. Shellmounds are man-made mounds of earth and organic matter that were built up by humans over thousands of years. They were created by the people native to the San Francisco Bay Area. The mounds served many purposes. “Shellmounds are created by my ancestors as ceremonial places and as burial sites,” said Corrina Gould, spokeswoman for the Confederated Villages of Lisjan and co-director of Indian People Organizing for Change. Lisjan is one of more than 40 native groups that call the greater Bay Area their home. As colonizers and settlers came to Northern California, they lumped these distinct indigenous groups into one. These days this larger group is most often called Ohlone. A shellmound in Mill Valley, as photographed by archaeologist Nels Nelson in 1909. From Nelson's report "Shellmounds of the San Francisco Bay Region." These bodies were then covered with layers of soil, shell and rock. Growing bigger over time, the shellmounds transformed the flatlands by the bay waters into an undulating, awe-inspiring scene. The shellmounds also served as an active space for the living. “People would come and they would trade with each other, and they would have ceremony at the top of these mounds,” Gould said. Archaeologists have found remnants of communal fireplaces, workshops and homes on the mounds. They were so central to community life that it seems there wasn’t even time for topsoil to build up or for grasses to grow, said UC Berkeley anthropology professor Kent Lightfoot. Their height, sometimes taller than 30 feet, served as a focal point to navigate across the bay waters, or to communicate with other tribes. “You could send signals to other people across the bay because you could see their fires,” Gould said, which could, among other things, warn groups about toxic red tide. 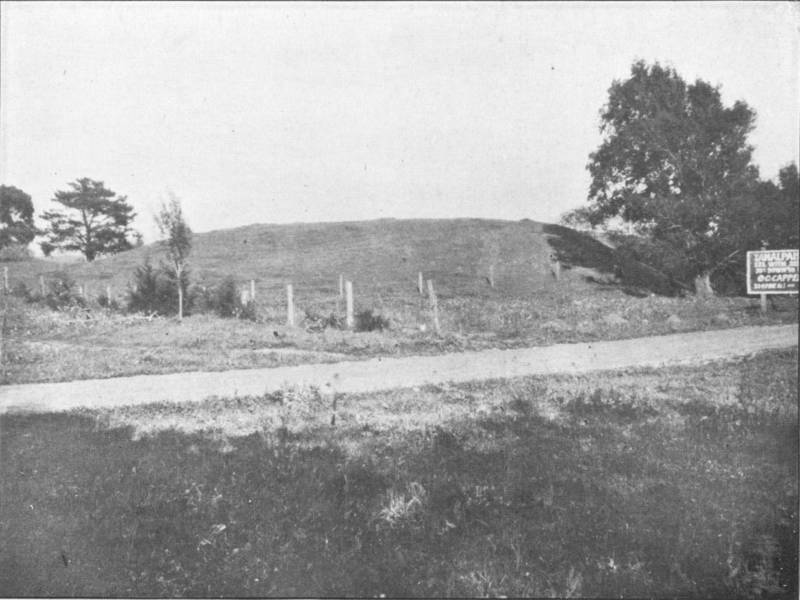 A shellmound in San Rafael, as photographed by archaeologist Nels Nelson in 1909. From Nelson's report "Shellmounds of the San Francisco Bay Region." “There’s all of these things that are in these mounds that tell us this rich history of our people for thousands and thousands of years,” she said. Gould is referring to remnants of daily Ohlone life, like the foods that sustained them: not only the mussel, clam and oyster shells that give the mounds their name, but traces of salmon and sturgeon, deer, and acorns from the ample oak trees. 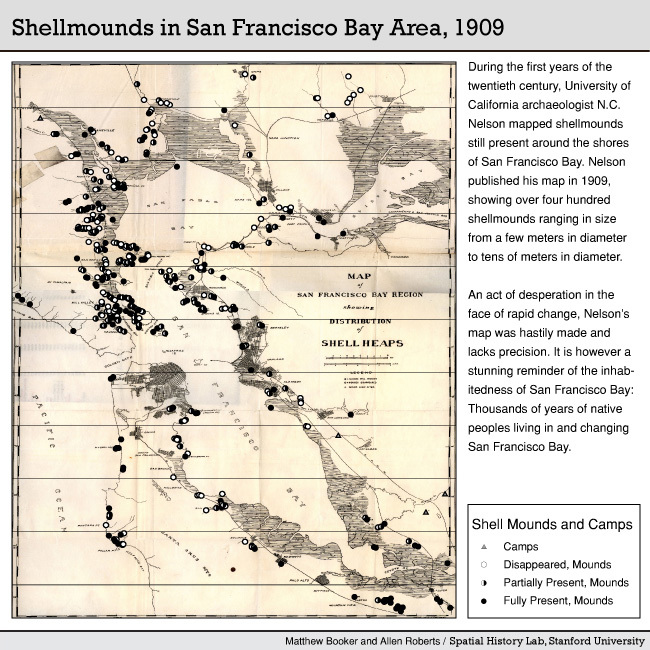 How many shellmounds were in the Bay Area? The San Francisco Bay Area was a popular place to live for Native Americans. Natural resources from both water and land were abundant here. The area from Point Sur in the south to the Carquinez Strait in the north was one of the most densely populated places for indigenous people north of Mexico, with roughly 10,000 inhabitants. All these people meant a lot of villages, and therefore a lot of shellmounds. But as colonizers and settlers came to California in the 1700s and 1800s, the native population was devastated. They were killed by newly introduced diseases, starvation and massacres. These killings were at times funded by the state of California and the U.S. government. Native people began to disappear from their traditional land. When their houses of willow branches and tule reeds decomposed, the shellmounds were all that was left to mark where their villages once stood. 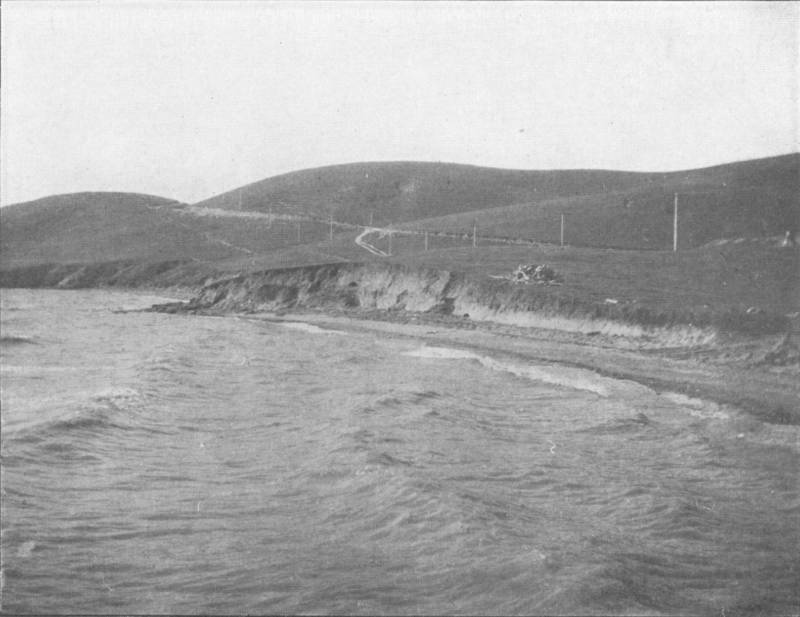 In 1909, a UC Berkeley archeologist named Nels Nelson counted 425 shellmounds around the Bay Area. He thought there had been many more, too, that were already worn away by water, time and development. Corrina Gould believes that of the shellmounds Nelson documented in 1909, roughly four can still be seen, in such places as San Bruno, Fremont and Richmond. What happened to the shellmounds? Let’s take a look at the Emeryville Shellmound as an example of a larger trend. This shellmound was the biggest one recorded in the Bay Area, more than three stories high and 350 feet in diameter, Gould said. That’s larger than a football field. But if you look for the shellmound today, you won’t find much above ground. In the late 1800s, developers lobbed off the top of the shellmound to create a dance pavilion. At its base, they constructed an amusement park. Decades later the shellmound was leveled completely to make way for a paint factory. And in the early 2000s, this once-thriving native village became a thriving outdoor shopping center. 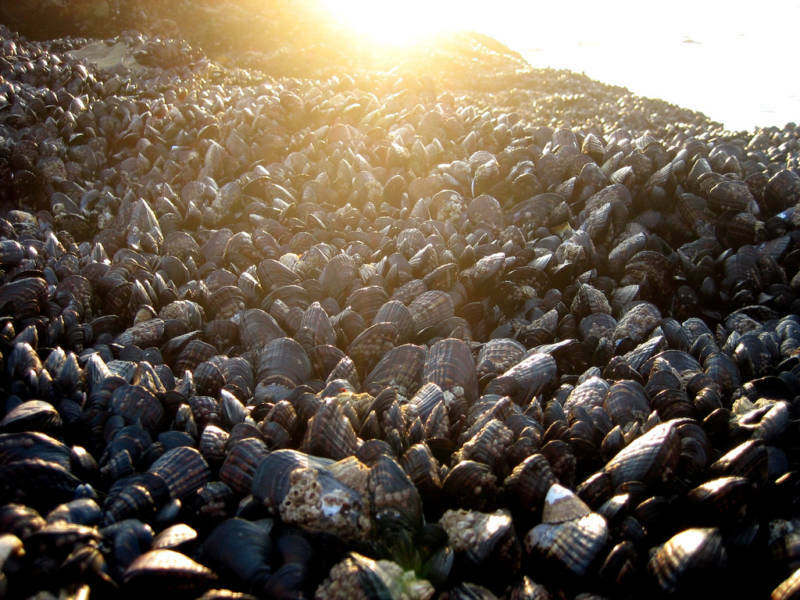 Flattening shellmounds like this happened across the Bay Area. But Gould emphasized that the shellmounds are still here, albeit underground. The soil where shellmounds once rose is distinct. It’s a dark, rich color from organic material, with white pockets colored by remains of shells. It is still possible to find human remains underground, too. During the construction of the Emeryville shops in the early 2000s, construction crews and archaeologists uncovered human bones. Gould said the shellmounds are beneath landmarks that Bay Area residents pass by daily: under a Burger King in downtown Oakland, or Yerba Buena Gardens in San Francisco. The rich soil from the above-ground parts of shellmounds was used to pave roads, fill in parts of the bay and fertilize gardens. Many of the human remains, such as bones and artifacts, have ended up in museums. UC Berkeley’s Phoebe A. Hearst Museum of Anthropology has more than 5,000 sets of human remains from the Bay Area. A “set” could represent the remains of one or multiple people, or even just an isolated component of a person, according to a spokesman for the museum. Two years ago, Gould and other Ohlone people viewed the Hearst Museum’s collection of human remains. What’s happening with shellmounds now? Gould and other Native American activists are fighting to acquire land where the oldest Bay Area shellmound, nearly 5,000 years old, once stood: West Berkeley. The space is currently an asphalt parking lot at 1900 Fourth St., between the Fourth Street shopping corridor and the bay. It has been designated as a Berkeley landmark since 2000. Developers have sought to build housing here in recent years, but their proposals have been rejected by the city of Berkeley. Gould hopes eventually the land will be overseen by Ohlone and other Native Americans. 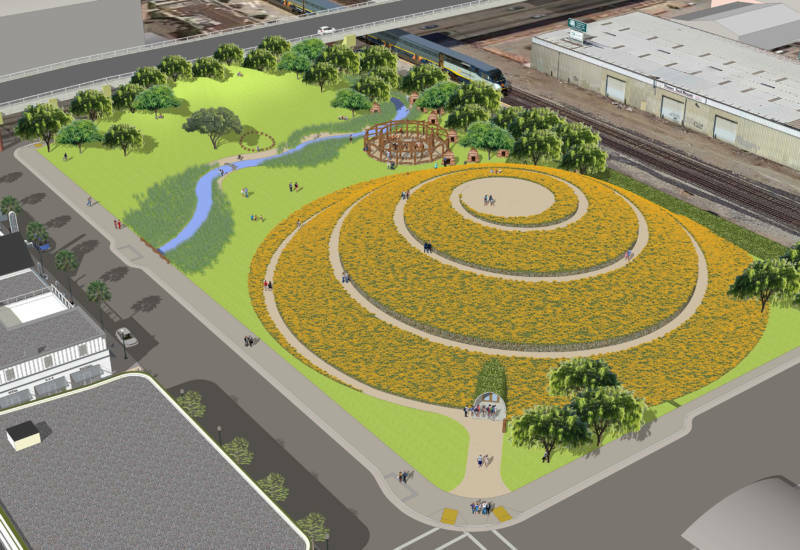 Her vision is a space with native plants, a circular dancing structure for Ohlone ceremonies, and a 40-foot-tall mound with a spiral path and information about the Ohlone. Gould and others regularly hold intertribal prayers here. Over her decades as an activist, Gould said Ohlone events have grown stronger, and the crowds have grown larger. She sees this as part of a larger Ohlone resurgence: being consulted by the Hearst Museum that houses bones of their relatives, reviving dance steps no one has followed in 100 years, and learning traditional languages — not spoken in generations — from tape recordings. 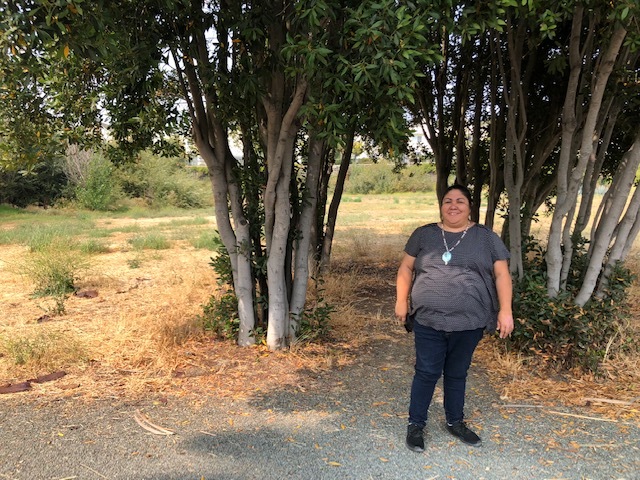 Her hope is to renew more Ohlone ways, just as she hopes to build a new mound on the site of an old one, once flattened.